DA Form 4797 - also known as the "International Standardization Agreement Ratification-implementation Data Sheet" - is a United States Military form issued by the Department of the Army. The form - often mistakenly referred to as the DD form 4797 - was last revised on January 1, 2004. Download an up-to-date fillable PDF version of the DA 4797 down below or look it up on the Army Publishing Directorate website. 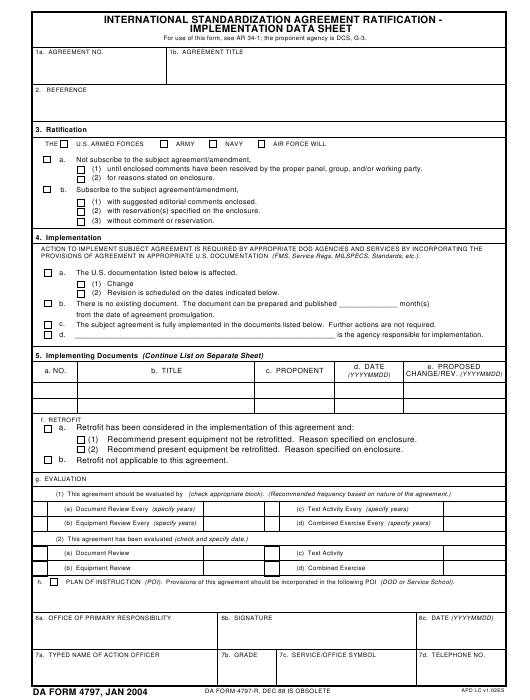 For use of this form, see AR 34-1; the proponent agency is DCS, G-3. until enclosed comments have been resolved by the proper panel, group, and/or working party. for reasons stated on enclosure. with suggested editorial comments enclosed. with reservation(s) specified on the enclosure. PROVISIONS OF AGREEMENT IN APPROPRIATE U.S. DOCUMENTATION (FMS, Service Regs, MILSPECS, Standards, etc.). The U.S. documentation listed below is affected. Revision is scheduled on the dates indicated below. from the date of agreement promulgation. The subject agreement is fully implemented in the documents listed below. Further actions are not required. ________________________________________________________________ is the agency responsible for implementation. Recommend present equipment not be retrofitted. Reason specified on enclosure. Recommend present equipment be retrofitted. Reason specified on enclosure. Retrofit not applicable to this agreement. PLAN OF INSTRUCTION (POI). Provisions of this agreement should be incorporated in the following POI (DOD or Service School).